2. 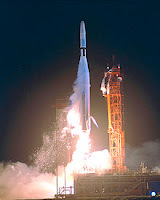 This is a picture of the Mariner 1 launch on July 22, 1962. Its purpose was to fly past Venus and I suppose collect some sort of complicated space data (I skipped that paragraph). Instead, the Mariner 1 began behaving erratically and was sent into the ocean. The cause? A NASA employee had missed a hyphen while writing the computer code for the mission. The cost? $18.5 million dollars. I bet that guy felt bad. I dropped an entire tray of coffee mugs once when I was a waitress, so I can relate. 3. 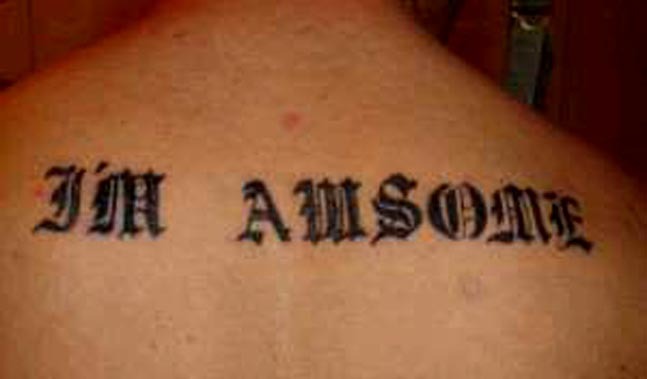 Note to self: If I ever get anything indelibly inked on my skin, it will only be from someone who can satisfactorily pass an impromptu spelling test. No. Actually, you're not awesome at all. 4. This is a blunder of epic proportions. Not only must the engraver have spent hundreds of hours creating the mold for the 2008 issue of the Chilean 50 peso coin, but I'm sure the odd person must have checked it over before minting several thousand of them and sending them into circulation. Even I would have caught that one. 5. And finally, the most horrendous of all typos. Earlier this year Penguin Books Australia issued an apology for a recipe in the Pasta Bible cookbook which called for "salt and freshly ground black people." Ouch. 7000 copies of the book were destroyed, although those that had already been shipped to retailers were not recalled. Hmmm...just goes to show that spell check isn't always your friend. BAHAHAHAH!!!! this just made me scream! so funny! especially the last one!